The best professional writing app for OS X and iOS – no, not Scrivener – just received a major new release. Here’s an overview of the new features, and why it should be in every writer’s toolbox. Ulysses is a Markdown environment for writing, with robust electronic publishing capabilities. For many years, writers have traditionally struggled with a motley collection of folders, Word files, and strung-together workflows to convert .DOCX documents to e-books or online articles. Ulysses makes that kludgy process obsolete by doing everything within the program. The true beauty of Ulysses is that files are stored in plain text, marked up with a lightweight, human-readable syntax of control characters that gives you remarkable formatting capabilities – while ensuring 100% compatibility with any standard text editor. 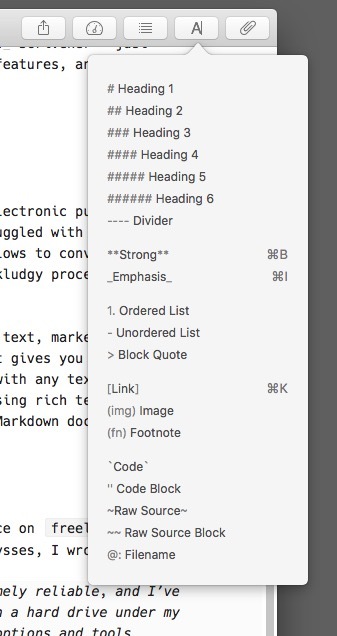 Markdown is the most versatile and future-proof way of composing rich text documents. 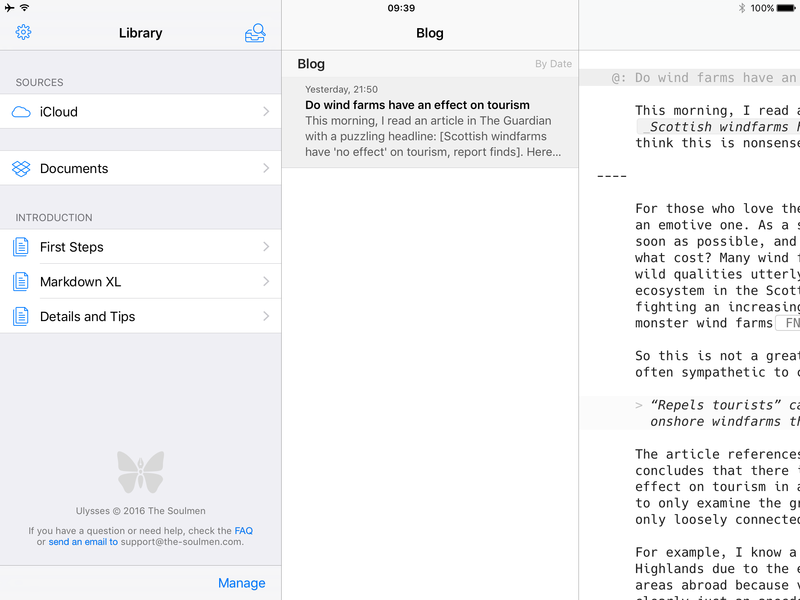 You can easily convert a Markdown file to a beautifully typeset Word, PDF, EPUB, or HTML document – all within the app1. While any text editor is capable of generating a Markdown document if you know the syntax, Ulysses makes things easier by providing a lightweight WYSIWYG interface. This reduces the learning curve and makes Markdown easier to use. Ulysses also has many valuable organisational features, including the ability to attach notes and images to individual documents, or ‘sheets’ in Ulysses parlance2. You get access to a complete folder structure within the app and it’s easy to combine multiple sheets into a single output, for example a bunch of chapters into a complete book. 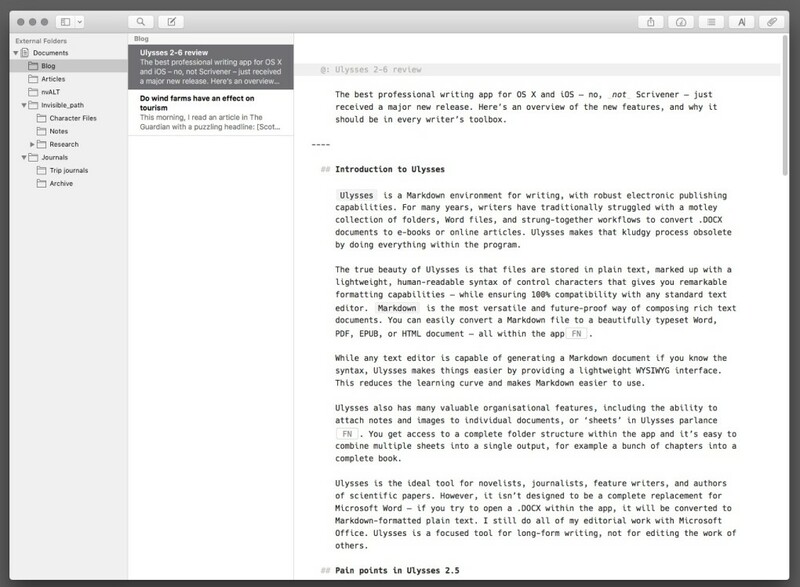 Ulysses is the ideal tool for novelists, journalists, feature writers, and authors of scientific papers. However, it isn’t designed to be a complete replacement for Microsoft Word – if you try to open a .DOCX within the app, it will be converted to Markdown-formatted plain text. I still do all of my editorial work with Microsoft Office. 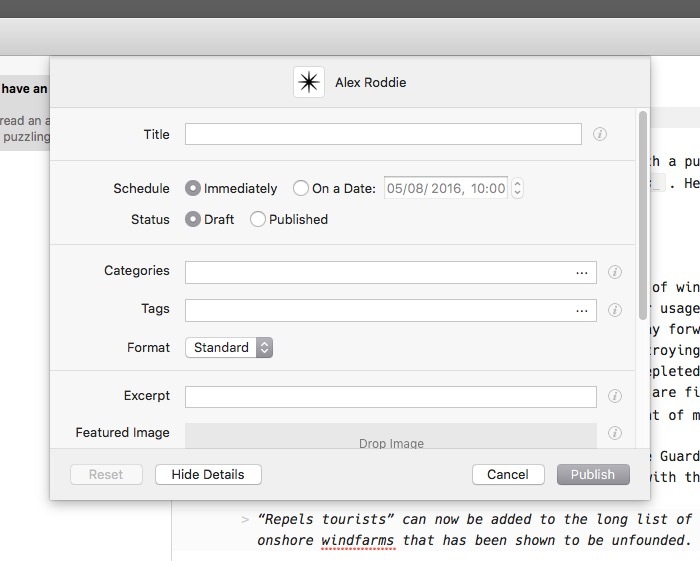 Ulysses is a focused tool for long-form writing, not for editing the work of others. It stores Markdown files in iCloud; sync is fast and extremely reliable, and I’ve learned to stop fretting that my files aren’t all stored on a hard drive under my direct control. I have come to really appreciate the many options and tools Ulysses gives you: complete control over folder structure, fast Markdown notation, a best-in-class writing and editing experience, built-in document notes and word-count targets, plus a whole range of features I haven’t even tried out yet. Most of these points stand, but I came to realise that iCloud-only sync was, in fact, a pain point for me. I don’t have an iPhone. My smartphone is an Android device, which makes it impossible to access Ulysses documents stored in iCloud. I’ve always been deeply uneasy about trusting my data to locked-away proprietary databases (one of many reasons I abandoned Scrivener years ago), and although iCloud sync in Ulysses has always worked perfectly well, I was premature in stating that I had learned to stop worrying about my files. The fact is, I don’t trust Apple with my data, but I do trust Dropbox. When I store files in Dropbox, they are under my direct control: they physically exist in my local filesystem, which means they are included in my automatic backup schedule. If Dropbox were to disappear right now, I would not lose a single file. Also, there is no ecosystem lock-in; I can access this data structure from any computing system. The same cannot be said of iCloud. When I travel in the mountains, I don’t carry my iPad with me, but I still need access to my files from my phone. At some point in June, I migrated a bunch of essential files out of Ulysses and back into Dropbox. Ulysses 2.5 continued to work well for much of my writing but it wasn’t quite the universal solution I was looking for. 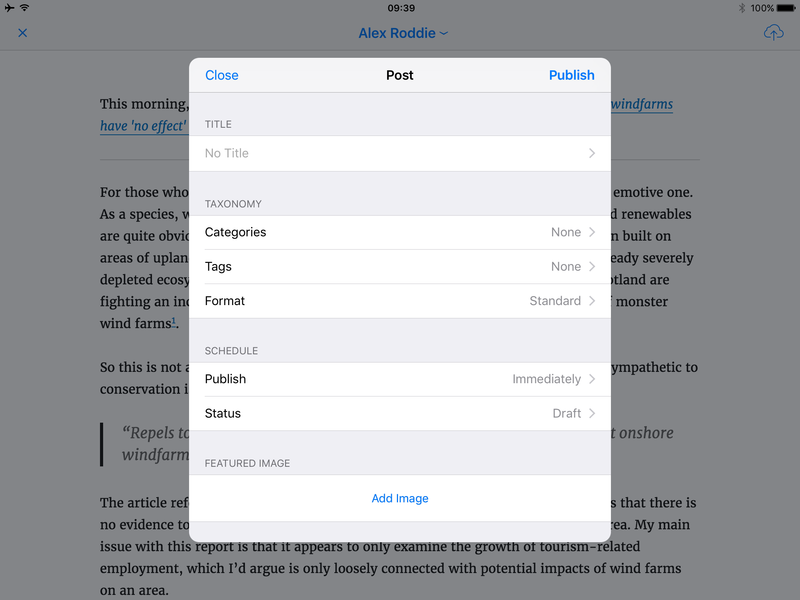 Finally, there was no WordPress publishing on the iOS side of things (despite some hacky workarounds). Much of my work still happens at my desk, on an OS X desktop setup, but WordPress publishing from iOS was high on my wishlist. These changes have made an enormous difference. There’s no longer any need to keep some documents in Ulysses and some in Dropbox, and I no longer worry about my documents being bundled in some proprietary iCloud library where I have no direct control over my files. I’ve transferred everything to Dropbox instead. If I change a file in Ulysses, the file changes on my disk – it’s completely transparent. Now I can create a file in Ulysses and continue to work on it using my text editor of choice on my phone. If I need to open a document in BBEdit for advanced processing or find/replace using grep, I can do that easily. WordPress publishing also works well. This site runs on WordPress, so the ability to publish a document directly from Ulysses to my CMS saves me time. It has made writing blog posts on my iPad significantly easier, too. As for the other changes, these are less important but definitely welcome. The lack of global document search on iOS was an occasional annoyance before; now it just works, and is both fast and efficient, despite having hundreds of files in the database. I like typewriter scrolling so I have enabled this and it seems to work very well. Some writers may be reading this and thinking ‘So what? Scrivener does most of that too, and I’ve been using Scrivener for years.’ Hear me out. Scrivener became trendy for fiction writers about six or seven years ago. At the time, nobody was writing on mobile devices; if you were writing a book, you were doing it on a desktop or laptop computer. Relatively few people were self-publishing electronically, compared with today. And Scrivener made sense in that era. It gave you the organisational features you needed, along with the ability to export a manuscript from a big collection of files. It was a great ‘one-stop shop’ solution to writing a book. Basically, it saved you from Microsoft Word hell. But the world moved on rapidly and Scrivener failed to keep up. Within a few years, publishing to Amazon’s KDP platform became mainstream. While it’s possible to export a functional MOBI file from Scrivener, the process remains complicated and buggy – and the generated file often has significant formatting glitches that have to be ironed out by hand. I speak from experience. Also, Scrivener has never played nicely with mobile devices. I remember, back in 2010-11, trying to access Scrivener document from an iPad. There was a hacky workaround involving a folder of plain-text documents within Scrivener that you could sync with Dropbox, but it never worked properly. The developers completely missed the boat with mobile. 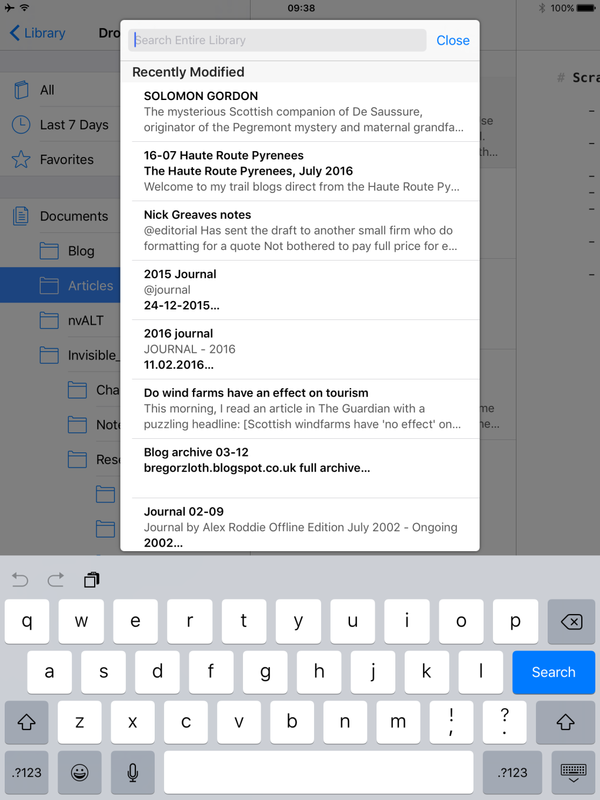 By the time the iOS version of Scrivener finally launched in 2016, multiple years after it was first promised, most Scrivener users had already moved on to other workflows if they wanted to write on iOS. Heck, many users had lost patience back in 2014. Finally, Scrivener still stores everything in a proprietary, opaque bundle that gives you no direct control over your files. You can include it in automatic backups easily enough, but if the package gets corrupted (which can and does happen), you’re in trouble. And there are numerous horror stories online from people who found their files corrupted after trying to use Scrivener in conjunction with Dropbox3. Scrivener remains difficult to learn, bloated with features, and is often counter-intuitive. By contrast, Ulysses has a slightly smaller feature set, but those features are the ones modern writers actually need – and they all work intuitively. The most important benefit is that Ulysses treats the desktop and the iPad/iPhone as equal platforms: with very few exceptions, the iOS version of Ulysses can do everything the OS X version can do. In today’s world, that’s a major benefit. 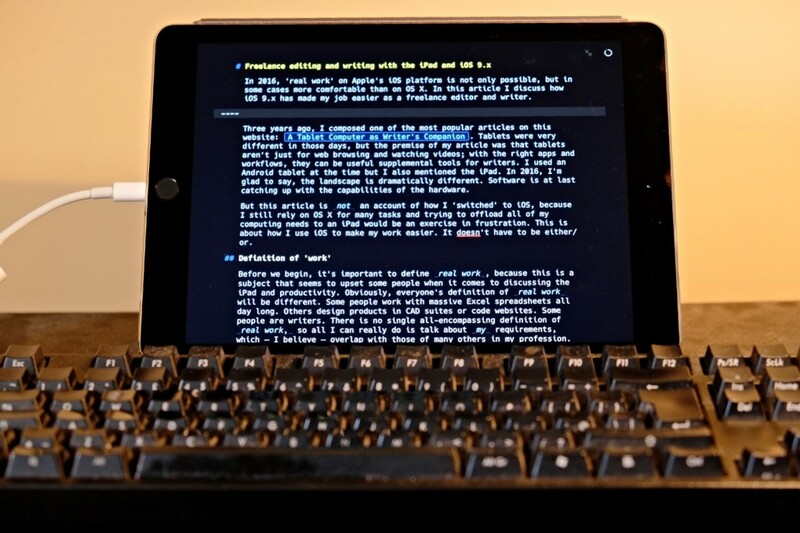 Ulysses is probably the perfect writing app, simply because it’s more than just an app. The plain-text philosophy – minimalist, conceptually beautiful, yet highly practical – will outlast most of the tools we use today. Will Google Docs still exist in fifty or a hundred years? Perhaps, but I doubt it. Will your grandchildren be able to read that story you wrote in Microsoft Word? Maybe, if you diligently convert it from one file format to the next over the years and decades. But plain text is universal. It can be read on the oldest computers you are likely to find still in active service today, and as the simplest and most widely used electronic data structure in history, it’s highly unlikely it will ever become unreadable. It’s resistant to corruption, takes up minimal storage space, and easily converted to beautifully typeset documents in any format you could wish – including rich text, images, tables, and other elements you might not have thought plain text could handle. 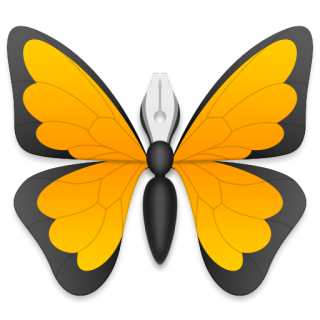 Ulysses taps into that incredible power while also offering you the best possible writing environment, and the best possible set of publishing tools for the modern writer. That’s why it’s the king of writing applications. Buy the Ulysses app at www.ulyssesapp.com. It’s £34.99 for the OS X version and £18.99 for the iOS version – and worth every penny. Disclaimer: I have no relationship with the developers.